Ideally located on Tel Aviv's, seafront promenade, the hotel, a center of vibrant activity in "the city that never stops"' is only moments away from Tel Aviv's fun and entertainment center, shopping, business and night life districts. The ninth-floor business lounge has been designed with the business person in mind and exudes a feeling of tranquility. The newest dining option at the hotel is the dairy buffet served in the lobby - "Eat All You Can" gourmet cuisine at an attractive price. The Health Club is another wonderful corner of the hotel, in which to relax, work out, swim in the pool, pamper yourself with a great massage and top it off with a sauna and Jacuzzi. 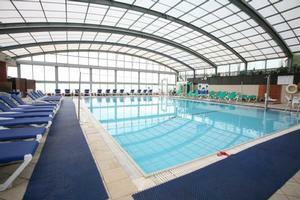 *Entry to the health club and spa and the use of its facilities (including the swimming pool, Jacuzzi and sauna) is permitted from age 16. Whether for business or pleasure in Tel Aviv - or a combination of both - the Crowne Plaza Tel Aviv just can't be topped. And bring the kids, too. The hotel's Freckles Club (open on weekends only)staff will make sure that your youngsters will be no less satisfied than you Who knows; maybe even more! 19$ child supplement. up to 1 child (2-19) In order to receive the published rates, reservations should be made at least 3 days prior to guest's arrival. 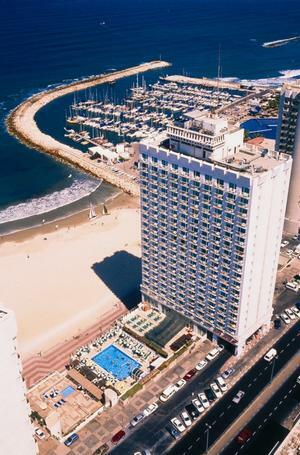 The Crowne Plaza Tel-Aviv is situated on the Mediterranean coast with direct access to the beach, adjacent to the city center and business district, only 3KM from Old Jaffa and 18KM from the airport.